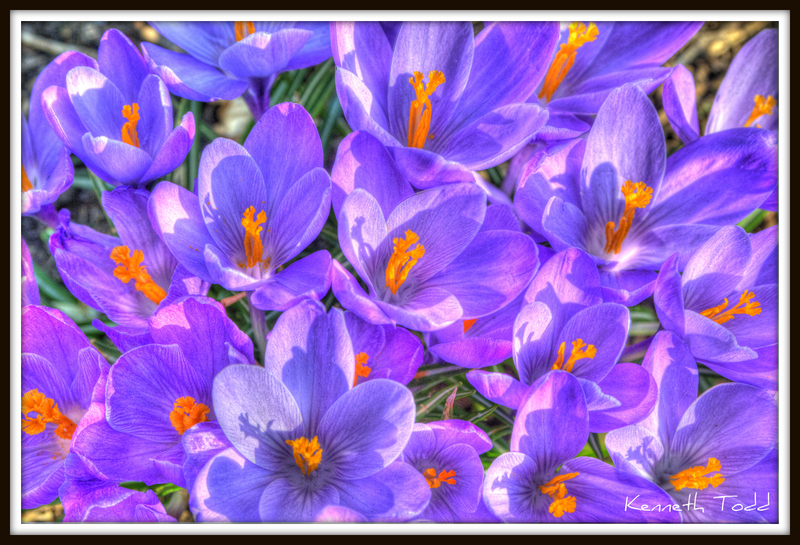 This is similar flowers to those I shot on March 08 (Crocus I think they are called), although slightly softer purple. This is the bunch that was just the one flower on March 12. This shot was an HDR shot comprised of 3 different photos. 1 photo was 2 stops underexposed, 1 was exposed correctly, the 3rd was 2 stops overexposed. Combined all together. Gives it a painterly type of feel. I hope you like it. The software I use for my HDR photography is Photomatix Pro. Download your trial version for free and go have some fun. I believe that flowers have vibrant colors naturally, HDR would never be able to enhance that. Only creates a manipulated version. My honest opinion. No offense to anyone. You are correct. HDR however has become synonymous with highly saturated images, when in fact it is not meant for that. It is to catch the entire range of shadows and highlights. So this one worked for me as had already shot same flower type normally. thanks for comments and visiting. Lovely but even I feel that HDR doesn’t do any good here. Anyways I read your reply on above comment, so I understand. Hi Kenneth—those are Snow Crocus blooms—one of the earliest spring bulbs to come up! Ahh, thanks Cindy. They’re beautiful but never know the names of most of flowers I photograph. Thanks for teaching me. I was prepared to not like this because I too like my photos “real” but you’ve done a fantastic job with your magic tools & I love the effect.